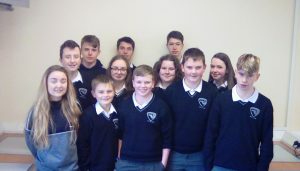 Coláiste Pobail Acla has a very active Students Council comprising of two democratically elected representatives from each year group. It is the official voice of the students; the avenue through which the students have an input into the running of the school. The council holds monthly meetings during which the students have the opportunity to raise issues that concern them. A designated teacher attends the meetings and the Principal also attends at various stages throughout the year. Student council elections are held every September and the new council elects a Chairperson, Secretary and PRO at their inaugural meeting. Minutes are recorded at every meeting. Each representative is invited to raise issues that their class are concerned about. The issue is discussed at the meeting and a course of action relating to that issue is decided upon by the council. Throughout the academic year the Students Council holds various activities for the student body. The student council also meets the Board of Management annually to discuss any issues the council might have. Members of the student’s council also examine school policy documents and have the opportunity to suggest amendments prior to the policies being officially put in place. Coláiste Pobail Acla’s student’s council liaison teacher is Ms Patten.